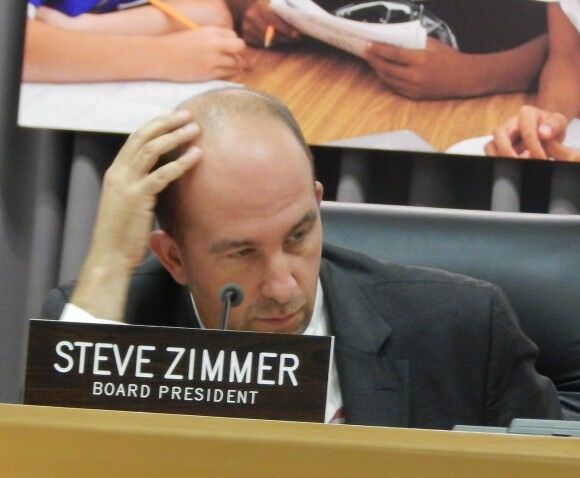 As the operators of El Camino Real Charter School High School prepare to ask the LA Unified board for approval to turn three vacant elementary school sites into new charter schools, one of the main hurdles they face is the growing skepticism of board President Steve Zimmer. The sites are located in the western San Fernando Valley, one of them in Zimmer’s district, and were shuttered decades ago due to declining enrollment in the area. With the district unwilling to part with the valuable land but without any specific need for them, the buildings have become crumbling eyesores. LA Unified still has no enrollment need for new traditional schools in the area, giving it few options for sites that many view as a major blight on the western Valley community. Issam Dahdul, facilities development manager for LA Unified, said selling the land isn’t an option because the district may have a future need for new schools. Also, he explained, state law says before a district can sell land, it must first offer it to charter school operators. Starting a year and half ago, district leaders, including former school board member Tamar Galatzan, voiced support of El Camino’s plan to develop the sites into charter schools. The plan called for El Camino to refurbish or rebuild the sites and sign a long-term lease with the district. Thirty-five percent of the building costs would be put up by the district from bond money set aside specifically for charter school development, Dahdul said. El Camino leaders started holding community meetings in 2014 to present their plans to convert the sites — Highlander, Platt Ranch and Oso Grande elementary schools — into feeder elementary or middle schools for El Camino, which converted from a traditional district school into a charter in 2011 through a majority vote of the staff. Zimmer expressed general support at the time, but much has changed since then, including his election to board president in July. Last Tuesday, El Camino’s leadership approached the board for approval to convert to a charter management organization (CMO), which essentially opens the possibility for the school to operate more than the one charter. The vote was 6-1, with Zimmer dissenting. Zimmer now objects to El Camino’s becoming a CMO. While the conversion of El Camino to a charter school came about from school staff approval, the same people have no say in converting to a CMO. Such a conversation rarely occurs, Zimmer said, and he could only recall only one other instance in LA Unified. Earlier this year, El Camino tried to take over nearby Canoga Park High School, but district staff found numerous problems with the plan, and the application was withdrawn before it came before the board. “Let me just be very straightforward: My thinking changed profoundly during the effort to take over Canoga Park,” Zimmer said. El Camino’s five-year charter renewal is due to come before the board next month, when the school’s leadership may begin presenting part of its plan to develop the closed sites. It is unclear how continued opposition from Zimmer might affect the effort. Four votes against the renewal would close the school. Zimmer’s skepticism isn’t the only hurdle El Camino faces. Some neighbors of the schools objected strongly to the plan during community meetings in 2014, citing increased traffic, among other issues. Zimmer said although he opposed the CMO move by El Camino, he will examine the plans for the redevelopment of the sites on their own merits and has not yet made up his mind. “The one thing I will say about Oso is, before I leave this job, I want to make sure we have finally done right by the community and removed that blight and hopefully have an educational use on that property,” he said.